As we congratulate the Neopian Times on their 600th issue, please join us on a trip down Memory Lane. Needless to say, a lot has changed since Neopets saw the light of day on November 5, 1999. We love hearing stories about the good ol' days, and was curious to hear what some long-time players think about some of the most significant events and changes that have taken place over the years. Like our good friend neo492492 said so beautifully: "When I think about the things that have changed the most on Neo, a big long list runs through my head. It's like seeing my life flash before my eyes, except that life is limited to pixels and the past 11+ years... and Neo life can be more fun!" I (Bewytched) want to share my own favorite memory that comes to mind when I think back on ALL the years I've been on Neo, which will be 12 years this June! When I think about Meristones, nostalgia sets in and reminds me of how much I still love this site. As the name suggests, it was in Meridell, and I believe it could be found inside Meridell Castle at the time. Oh, how I loved that game even if the Draik always tried to cheat! This game is based off a real game (as most usually are), and I have loved that original game for many years as well. When not playing against a cheating Draik, it shows how a simple game can be SO much fun!! I wish they would bring back a similar game, because I would be playing to my daily limit- much like with Dice-A-Roo, another game I've been playing since the beginning of my time here. Games... yep, that's what makes me reminisce and smile when I think about my years on Neopets! Say WHAT? A Grarrl wearing a skirt? Everyone I (Hottendott) have spoken with has mentioned the conversions of our Neopets as one of the major changes of Neopian History. A lot of people were dismayed when TNT changed the artwork for all pets on the site to allow them the ability to wear clothes and a variety of other wearables. Some pets were given the option to keep the old artwork and stay "unconverted", as we prefer to call it. Still others were automatically changed to the new artwork. At the time, it was a controversial issue, but it's safe to say that most of our fellow Neopians have embraced the ability to customize our pets. When NeoCash cards were introduced, slowly but surely they were seen in shops around the world. With the purchase of the cards, precious gift boxes were found. The gift boxes paved the way for NC item trading, which has become quite popular since its introduction. In fact, it is not difficult at all to spend quite a bit of time on the site, trading for your favorite and most beloved items. Or just trading because it's addictive. What many people don't realize is that Neopets have seen many artwork makeovers over the years. Some of the oldest species, like the Uni and the Aisha, have changed numerous times. Hottendott asked neo492492 how these changes were perceived by the players: "People generally responded very well to the various pet changes. Of course, those tended to be one at a time, and not affecting every color and species that existed. But it used to be fun, believe it or not. You'd wake up one morning and your Kougra had changed pose just slightly, and it looked so much better. Or you'd get to vote for what the new Gelert should look like. It was generally perceived very favorably." It was not uncommon to read sad stories on the boards about people trying to move a pet to a different account, thus losing their pet to a stranger lurking the pound. In April 2007, the old pound closed down to make way for the new and improved version. Thanks to some hard work from some awesome coding Myncies, we are now able to transfer pets safely between accounts without having to throw our poor pets into the pound before adopting them back. With this wonderful new feature, users were also given the ability to trade pets. 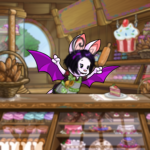 One neopet for a different neopet, making the Pound Chat possibly the busiest board on Neopets these days with so many people looking to trade for their dream pets. Mention the word "war" on the boards and people will go nuts with nostalgia, remembering the old wars. Players would sharpen their weapons, whilst pets would anxiously wait for some Battledome action. The introduction of the Battledome had a huge impact on the site; the greatest was on the Neopian economy as far as codestones, dubloons, neggs and weapons were concerned. So many players love training their pets, taking part in Battledome tournaments in their guilds, etc. Recently, an updated version of the Battledome came about, with the added bonus of winning items and neopoints. Let us hope that there will be many more wars for our pets to fight in the Battledome! "The other Neopia-changing events I look back on fondly are the discovery of Mystery Island and, soon after, the arrival of Dr. Sloth and his Virtupets plot. They were both such a big deal at the time, and it is really hard for me to separate the sequence of these two events. Such events introduced the tradition of plots discovering new worlds and expanding our neo-world," explains Chooterboo. Today, the tradition still holds, with those same worlds getting their very own artwork makeovers with the conclusion of fun plots! I (Bewytched) get so excited about plots! I love them so much. They can either be really easy or very challenging, but I grin like a fool each time a new step is released. I immediately get to solving and completing it. There is so much satisfaction in that for me. I do the best I can, and I am always so proud to see that trophy or that avatar at the end to remind me of the hard work I put into it and the fun I had along the way! My favorite plot is still by far the Tale of Woe plot that introduced Neovia to the site. I love that world. The story (plot) leading up to its arrival was just incredible. Neovia is still by far my favorite world, and I am so proud of the trophy and the site theme I earned from that plot. "Something else I swore I'd never get involved with avatars! I remember when they first came out. I thought collecting them was a silly idea. Was only in the last 18 months or so that I started to actively collect them," admits morpheus_lemon. Long time player Toxiktoast agrees: "I would even go as far back to say the introduction of the Trading Post (which lead to more/safer item trading). Another big change is premium. Something else I swore I'd never get involved with avatars!" I (Bewytched) love avatars, but I have been using the same one since its release, and that is the Magical Kauvara avatar. I don't recognize myself when I don't use it. Thankfully TNT introduced Neoboard Pens in the NC Mall so I could keep my treasured Kauvara avatar as well as have my other favorite avatars to use on the boards at the same time as well. As far as hunting them goes, I am addicted to getting an avatar so long as it is one I actually LIKE. Collecting every single avatar possible has never really been my thing. I collect the ones that I like and am very happy with that. However, that does NOT stop me from getting excited when I earn a new avatar for a site event or some other special occasion though. I do love those! I (Hottendott) was surprised to hear how popular NeoQuest was when it was first released. Pokewomon had this to say: "NeoQuest isn't really thought of as much these days, but it was a huge, huge, deal when it was first released. The site would go down for hours because so many people were trying to play. Everyone talked about it, and for the first few months, it completely dominated the site. TNT had to put limits on when you could play and how long you could play, due to the stress the amount of playing was putting on the servers. It was absolutely insane; and I honestly don't think there's ever going to be an experience quite like that on the site again anytime soon." I was curious to hear if NeoQuest II was as big of a deal as NeoQuest 1: "NeoQuest II wasn't nearly as big a deal, oh no. I think a lot of it was that, by the time it was released (in 2004? ); there were so many other things to do on the site. With NeoQuest, that wasn't the case. I mean, it came out in 2001! At that time, the Battledome had only been opened a few months earlier, most of Neopia had yet to be discovered, and there were only a handful of games on the site. NeoQuest was something new and exciting. Everyone wanted to play it, hence all of the downtime. We all got used to seeing the Down For Maintenance Pteri on a regular basis," explains Pokewomon. I (Bewytched) have always loved NeoQuest II better than the original. There is just more of a feel of traveling with companions who, after many hours of playing, can feel like friends to me. When I have time, I always try to play NeoQuest II at least once a year. It is a tedious game, but I so love traveling with Rohane, and meeting up with Mipsy, Velm, and Talinia. I love the places... the battles... all of it! It just feels more of an actual QUEST story to me than the original does. NeoQuest II manages to keep me enjoying it year after year whereas I struggle to get motivated to even START NeoQuest. All the hype may have been for NeoQuest back in the day, but NeoQuest II has been the one to capture my heart even after all these years! We would like to end with some words from Coolgirl, who happens to be the owner of THE oldest active account on Neopets. What better person to ask, when you don't want to bother overworked staffers? "I'm sure most people are going to say the renovation of all of the artwork. For me, however, it goes farther back. I think the biggest change was the population increase. When this site became very popular, the whole site had to be changed to accommodate all the page views. Games, such as Chia Bingo, could no longer be supported nor could chats that used to be in shops. The message board was opted as better monitored for younger players. They also started doing more plots to keep people entertained and coming back rather than relying solely on their fake economy and flash games." And with that, our stroll down Memory Lane comes to an end. Well, at least for this article. We thank the Neopian veterans who shared their opinions and memories with us. We hope that this article will help you too to remember the good ole days. They truly are worth remembering! For the newer players who have joined us, we hope that you create your own joyful memories of your own on Neopets. Neopets constantly changes, but that does not mean we cannot find something positive and new to remember, enjoy, and carry in our hearts forever!